The Checker Café opened in 1934. Located at 2125 Ridge Avenue, it was in the heart of the Ridge Avenue Entertainment District. When the show has nearly ended you will then see no other than our own sepia Gloria Swanson, who is direct from the Grand Terrace in Chicago and then you can tell the world that you have seen a real show. As with many jazz venues, the Checker Café was about “intersectionality” before it became a thing. The “sepia Gloria Swanson” was a female impersonator. In the 1980s under new ownership, the nightspot was renamed the Checker Club. It’s a bit ironic that the Checker is the only one of those Ridge Avenue joints to survive. It wasn’t the biggest or best known of the venues that lined the avenue during North Philadelphia’s jazz heyday in the mid-20th century. That distinction was probably held by the Pearl Theater on the next block, where Bailey and her sister Jura worked as ushers, and brother Bill tended the candy counter. Trumpeter Cullen Knight, who grew up a block away, says the Checker was where musicians hung out before and after the shows, partly because the food and the house trio were equally reliable. Its motto was “Good Food. Good Cooks. Good Service.” Among those providing service was Pearl Bailey, who did a stint as a singing waitress and is now immortalized by a mural on the building’s south side. In the ’30s, a gay singer known as the “Sepia Gloria Swanson” was also a regular. While some clubs, like Ridge Cotton Club and Blue Note, took their inspiration from famous Harlem venues, the Checker got its name from the black-and-white pattern painted on the ground floor. Its horseshoe-shaped bar had just enough space in its curve for a small band. Tables occupied the rest of the room. On the first day of summer, I had to report for jury duty at the Juanita Kidd Stout Center for Criminal Justice. As I stood in line to go inside the Jury Assembly Room, I noticed a panoramic mural. I made a mental note to check it out during the break. Words cannot convey my shock and awe to discover some of the images depict Philadelphia’s legendary jazz clubs, including the Blue Note, the Showboat and Pep’s. I brought together more than 40 elderly residents to complete it, and I worked jointly with them at the Center in the Park in the Germantown district of Philadelphia. Local artist, Deborah Zwetsch and I assembled their memories over the previous 80 years. The memories of the elderly are highly personal. Some are sentimental, some painful, some humorous, some ordinary. There is nothing ordinary about the depiction of the Ridge Avenue jazz corridor. Ridge Avenue is ground zero in the Philadelphia Housing Authority’s plan to transform the Sharswood neighborhood. There is widespread concern that PHA has no plan to preserve the neighborhood’s cultural heritage and historic resources. 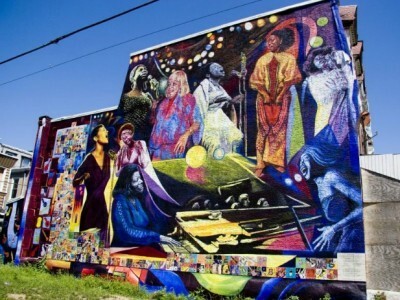 Cooper’s mural, showcasing Pep’s, the Showboat, Blue Horizon, Uptown Theater and jazz clubs on Ridge Avenue, tells part of the story of Philadelphia’s rich jazz heritage. We must capture the rest of the story while the folks who were there are still here. If we don’t, their stories will be lost for current and future generations. Before his awakening, Malcolm X was known as “Detroit Red,” a fixture on the jazz scene in Harlem. In 1948 while incarcerated in the Norfolk State Colony in Massachusetts, Malcolm joined the Nation of Islam. In 1954, Elijah Muhammad sent him to Philadelphia to expand Temple No. 12. Until recently, there was confusion about where Malcolm X resided during his time in Philadelphia. Eyewitness and videotaped firsthand accounts have confirmed his address in Sharswood. So All That Philly Jazz is sponsoring the nomination of 2503 W. Oxford Street for listing in the Philadelphia Register of Historic Places. Michael Bixler: The FBI files from 1954 have Malcolm X at living at 1522 N. 26th Street, but you have discovered otherwise. How did you confirm that 2503 Oxford Street was his correct address? We would sit up all night. When Malcolm was here, we’d sit up all night talking. We had a Unity House, a Fruit House, on 2503 Oxford Street. A big house. That’s where Malcolm would stay and all the brothers would come. The documentary was produced by the New Africa Center, part of the Scribe Video Center’s Muslim Voices of Philadelphia community history project. I have since spoken with Abdul Rahim Muhammad, executive director of the New Africa Center, who confirmed the address with Brother Hassan. While Hassan no longer lives in the Philadelphia area, I have his phone number so I will be able to get an affidavit from him if necessary. I also have contact information for Malcolm’s former press secretary and photographer. MB: What are the next steps to getting an historical marker placed? FA: Architectural historian Oscar Beisert and I are preparing the form to nominate 2503 W. Oxford Street for historic designation by the Philadelphia Historical Commission and the Pennsylvania Historical and Museum Commission. We will submit the nomination on or about February 21, 2016, the 51st anniversary of the assassination of El-Hajj Malik Shabazz [Malcolm X]. MB: Why is it important to you to have an historical marker placed there? FA: The historical marker is important because 2503 W. Oxford Street is a place where history happened. Malcolm X lived there for about six months in 1954. To be clear, the house does not meet architectural standards for historic properties. Instead, the building has significance in the cultural characteristics of Philadelphia and is associated with a person significant in the past. The building also exemplifies the political, social and cultural heritage of the African American community. What happened at 2503 W. Oxford Street laid the foundation for what is now one of the largest populations of African-American Muslims in the country. The historical marker will tell a more complete story about the Sharswood neighborhood. Sharswood is about more than concentrated poverty and race riots. It’s a community that provided safe havens from the indignities of segregation. Jazz giants roamed Ridge Avenue and iconic leaders like Malcolm X and Charles W. Bowser resided there. Back in the day, Ridge Avenue was a vibrant commercial corridor. The heart and soul of North Philadelphia was also an entertainment district. The Blue Note was at 15th Street and Ridge Avenue. The Bird Cage Lounge was one block up at Ridge and 16th Street. I don’t know whether it was named after him, but Charlie “Bird” Parker played there. The legendary Pearl Bailey began her singing and dancing career at the Pearl Theater, which was at Ridge and 21st Street. Ridge began its steep decline in the aftermath of the 1964 Columbia Avenue race riots and construction of the Norman Blumberg Apartments public housing. Fast forward 50 years, Ridge is on the rise. In 2014, the Philadelphia Housing Authority announced that transformation of the Blumberg/Sharswood neighborhood was its top priority. The Sharswood Blumberg Choice Neighborhoods Transformation Plan is a massive $500 million project that would, among other things, revitalize the Ridge Avenue corridor. The redevelopment of a community is about turning ideas into public policy and putting policy into action. PHA’s revitalization efforts are a targeted, coordinated development model designed to maximize the economic benefits of neighborhood revitalization, not the piecemeal dispersed development model of the past. To transform communities into neighborhoods of choice, there must be good schools for every child, quality affordable housing for all families, and a vibrant small business commercial corridor. The challenge is turning the ideas and rhetoric into policy and practice. I see preservation’s efforts to recognize and honor the cultural heritage of minority and ethnic groups as a valuable component of strong communities, in particular many of the communities that HUD serves. And I don’t just mean preservation of buildings and places, but also of diverse cultural ties and traditions, the intangible dimensions of heritage that together enrich us as a nation. History isn’t just a subject for books and documentaries. It’s alive and well in buildings, sites, and structures that shape our communities. They tell us who we are and where we come from – and it’s critical that we protect our past for present and future generations. The Sharswood/Blumberg Choice Neighborhoods Transformation Plan raises the question: Does PHA value the area’s tangible and intangible assets that give the neighborhood its identity? If so, will a transformed Ridge Avenue preserve the neighborhood’s cultural heritage for current and future generations?